A Mature Gap Year – Go Bicycle Touring! A Fistful of Gears confirms something I’ve suspected all along: over 40 cyclists can be just as adventurous as those 20-somethings who take to the road. Rog and Dee may be pushing 50, but that doesn’t mean they’re not up for traversing Iran, Pakistan, Turkmenistan or any other place that is perhaps, “off the beaten track”. Day 30: When is a campsite not a campsite? 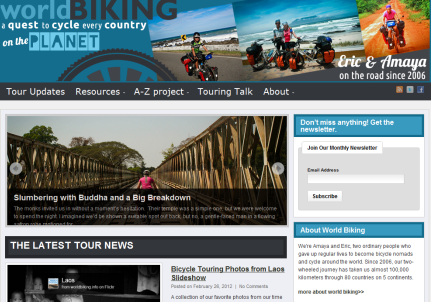 Another useful section on the site is Bikes and Kit. Here you’ll find detailed information and tips on choosing gear. Rog has been running Bigfoot Bikes for the last ten years, so he knows what he’s talking about. Rog and Dee are living their dream of a round the world bike adventure. Why not join them on a Fist Full of Gears as they continue their bike journey through Asia, Australia, New Zealand and then on to South America.